Two types of pedal dominate this year: drive and ambience. Two types of pedal dominate this year: drive and ambience. It’s no coincidence that the enduring appeal of the former is pretty much universal among electric guitarists, and the latter is riding on a self-oscillating wave of popularity amongst younger bands on both sides of the Atlantic right now. People say there are no guitar heroes these days: cobblers. There are plenty, they are just more concerned with texture than posture. 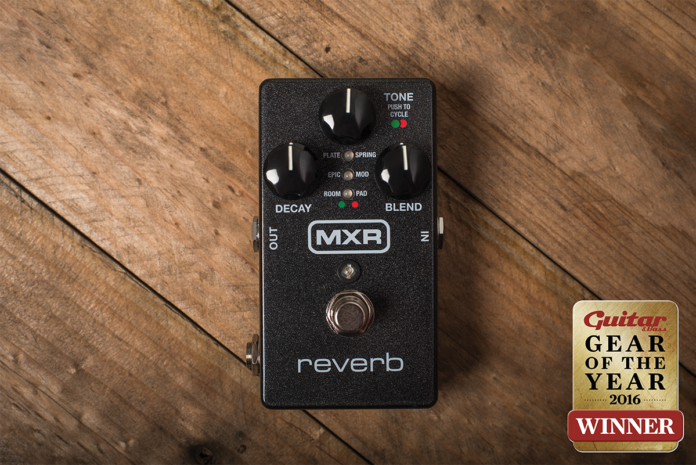 MXR’s M300 made an early impression in the 2016 gear stakes, catching G&B’s eye at Winter NAMM back in January. While there are more fully-featured reverb pedals from the likes of Strymon, Eventide and EarthQuaker Devices on the market, the M300 belies its simple three-knob configuration, with a host of digital algorithms under the hood. It’s a good £300 cheaper than some of those high-spec digital reverb machines, too. From convincing traditional sounds such as plate, spring and room to the atmospheric mod, epic and pad modes that will keep post-rock players and soundscapers happy, everything is well voiced. Plugging in an expression pedal ups the functionality still further, enabling huge volume swells. Richard Purvis: “All the throaty grind of a vintage Supro amp in a stompbox… without a valve in sight? It sounds like marketing puff, but give this little blue gem a chance to show what it can do and your cynicism will be dispelled. 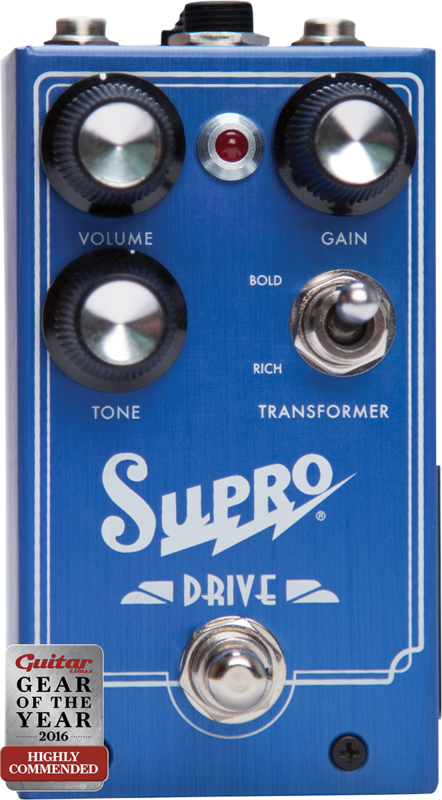 The Supro Drive sounds great at minimum gain, beefing up your tone with a hint of grit, and the fun keeps coming as you turn it up. The coil-tap switch gives you two voices: one bold and woody, one fuzzy and compressed. Coil-tapping what, exactly? An internal mini-transformer. This isn’t a transparent overdrive – everything it does is markedly chunkier than the bypass tone – yet it’s still touch-sensitive. 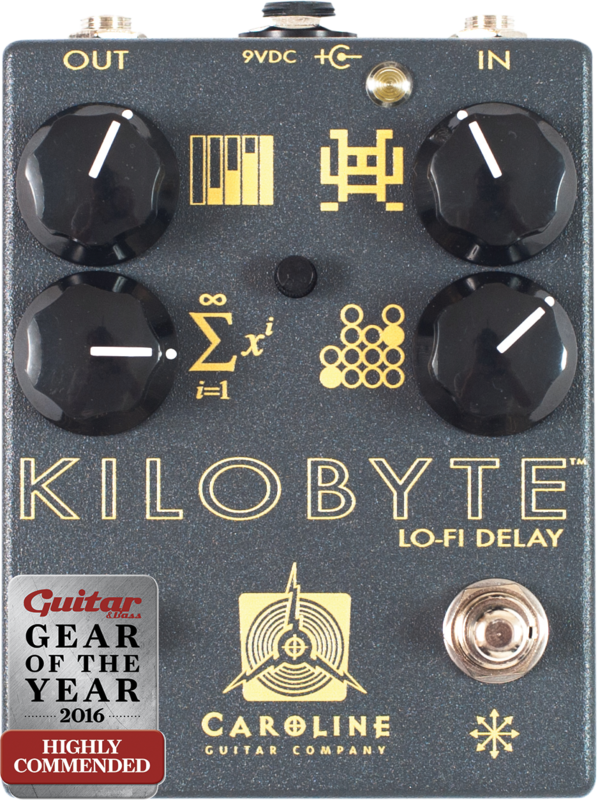 The successor to the PDF-1 Parametric Distortion Filter used to wantonly noisy effect by Josh Homme of Queens Of The Stone Age, left G&B with massive grins on our faces when we first encountered it in July. 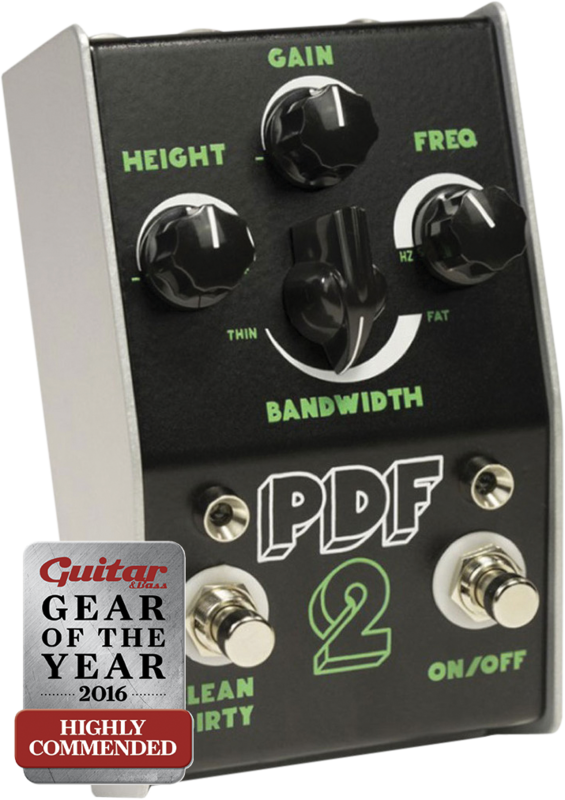 More versatile than the original from the Brit boutique builders, the PDF-2 is all about EQ filtering and overdrive. It can deliver a good approximation of a full-frequncy boost on the clean channel, and the dirty channel brings everything from beefy medium-gain overdrive to something not far short of full-on fuzz into play. With the addition of an expression pedal, filter sweeping, wah and manual tone-shifting effects become possible. Mr Homme may soon be splashing out on a PDF-2, and G&B would advise you to follow his lead. 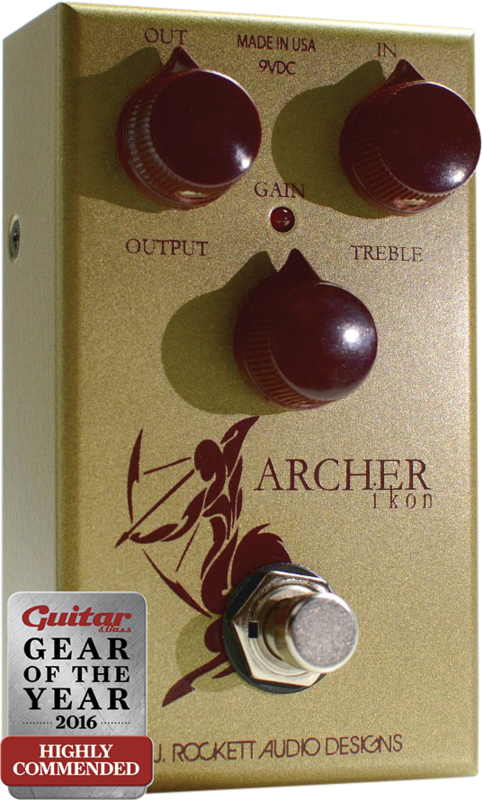 The Ikon was the winner of our fiercely-contested low-gain overdrive shootout back in May, and is the sister pedal of the winner of the effects section in 2015’s Gear Of The Year, the silver Archer. The Ikon is quite simply the closest you’re going to get to the hallowed sounds of the Klon Centaur, discontinued in 2009. That’s partly because it was created by Chris Van Tassel and Jay Rockett, who worked with Bill Finnegan on his Klon KTR pedal brand. 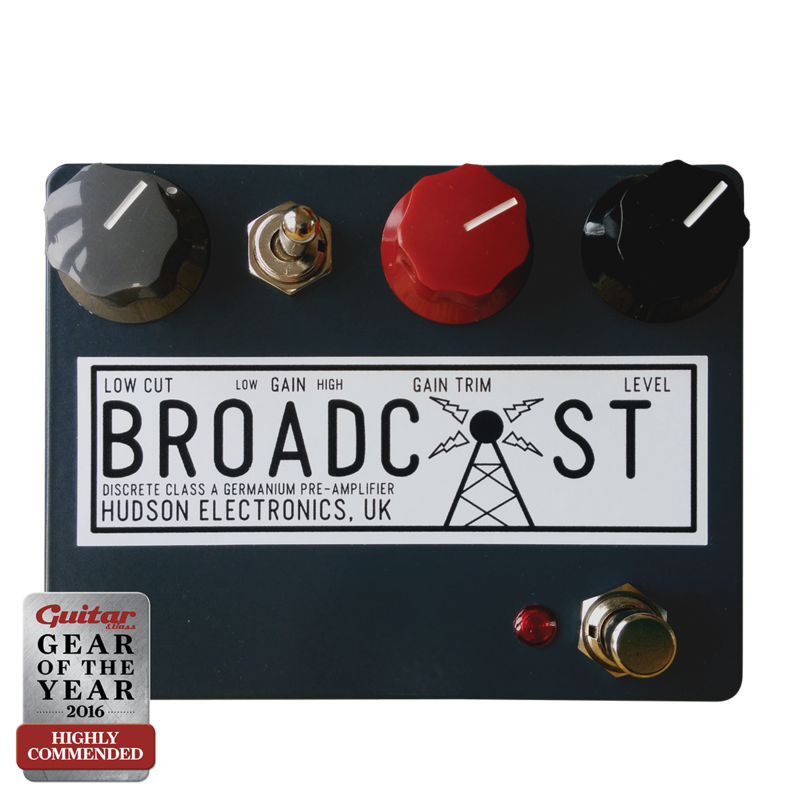 Yorkshire effects company Hudson Electronics hand-builds all of its pedals using the finest new old stock components, and the Broadcast is possibly its greatest triumph to date. Its RAF blue enclosure simply screams “NEVE” to any self-respecting audiophile. It’s a superlative preamp based on Neve topology with NOS germanium transistors and a steel-core Triad transformer, and is one of G&B’s favourite clean boosts. The Broadcast also boasts almost unparalleled versatility. The high-gain switch adds harmonic overtones aplenty, and it excels at everything from Voxy jangle to Marshall-like roar and even extreme, 60s-style fuzz. Gary Walker: “My favourite delay pedal of recent times had been Red Witch’s Titan. However, the Kilobyte stole in at the 11th month to take the prize. The true brilliance of this analogue-sounding digital pedal lies in the attack knob – which controls the amount of gain the overdrive preamp applies, giving the Kilobyte a wickedly gritty lo-fi sound – and the Havoc switch.